Sightseeing coursesVarious sightseeing plans. Please do not hesitate to contact us. JR Hirosaki station, hotels inside Hirosaki—Apple Road—Visitor Center of Shirakami Sanchi—Shirakami Line—Tsugaru pass, Mother tree—promenade along the big beech trees—JR Hirosaki station, Hotels inside Hirosaki. Hirosaki has the no.1 apple production volume in Japan. You can see apple designs in various places and the town is colored with apples. Why not head off to find your only apple. Apples were brought into Japan in 1861～1864(Bunkyu period of the closing days of the Tokugawa regime). It was first introduced into Hirosaki in 1875 by an American missionary who teached in Touougijuku school, and gave apples to their students on Christmas. The annual harvesting volume of apples in Hirosaki city is 160 thousand tons. It occupies 20% of the total gross production and is No. 1 in Japan. 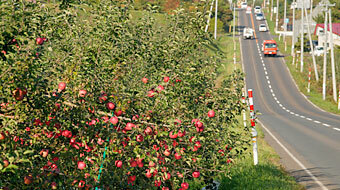 In Hirosaki city, 3 million 120 thousand apples trees are planted. “Apple Road” is the road which runs along this apple field. In the beginning of May, when the cherry blossoms begin to fall, the apples are rose pink flowers. In summer it is a little apple which bear fruit. In autumn the apples are ripened red. It is just like a scene in the movies to cheerfully pass through here. The contrast with Mount Iwaki which shows a different face depending on the season is also wonderful. The animals and plants which the beech forest had supported until today, the beech tree which is called “Mother earth”, “nature dam” taking part in humans from the ancient times, we introduce the beech forest entirely by a three-dimensional display and a large sized screen. 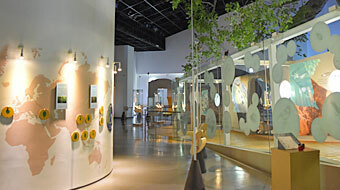 The large sized screen of 70mm, which is a world heritage “life shining forest” is worth seeing. Only viewing the large sized screen / Indivisuals 200 yen, Elementary and Junior highschool students 100 yen. In the upstream of the shirakami river, when thawining of snow, as the rushing current of white water would flow, it was named “Shirakami mountains”, the mountain on top of the white river. There is also another belief saying that an aged person of gray hairs lived in the mountain’s beast, and so it is called “Shirakami”. “Shirakami Mountains”which is the most large scale beech forest in the world is a general term used to refer to the beautiful mountains of 130,000 ha in the southwest of Aomori and northwest of Akita prefecture. 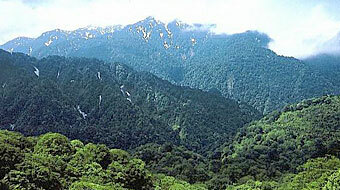 In December of 1993, the area of ten thousand 6971ha inside the mountains which is the most virigin nature were registered as a world heritage together with the Yakushima of Kagoshima prefecture. 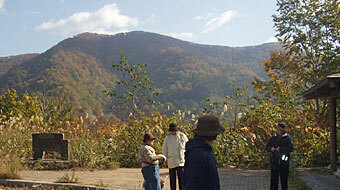 The feature of “Shirakami Mountains” is that the beech nature forest since 8000 years before is still left in a large scale without having an influence by humans. Regardless of the fact that it is at high latitude, various animals and plants exist. A nature ecosystem of extremely high value is preserved as it is. Mother tree, Promenade along the big beech trees. 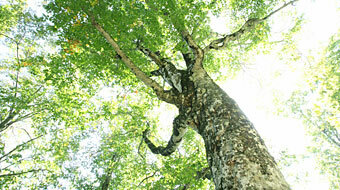 “The mother tree” of the Tsugaru pass beech forest, has a trunk rotation of 465cm, estimated age of tree is 400 years. 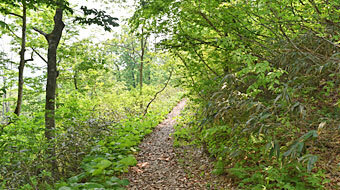 “Promenade along the big beech tree” is a promenade which starts and ends at the “Mother tree”. The breast height of the big beech tree is more than 1m. You can see 30 big beech trees during the 40 minutes walk in this “promenande along the big beech trees”. *taxisite plus is a service provided by the taxisite. *Regarding the information and photos of sightseeing spots and facilities on the homepage, we do not guarantee the accuracy, reliability and integrity. *For details of the sightseeing spots and facilities on our homepage (open hours, admission fee), please confirm on the official homepages respectively. *Admission fee, entrance fee, the cost of food and drink, parking fee, toll road fee are not included in the charge. Customer must bear the actual expenses. *If during the ride, customer changes the route or cancels the ride for personal reasons, customer must pay for the calculated amount which is applied by temporality charge from the beginning. *At the sightseeing spots, if the time is extended under a special contract with the customer, customer must pay for the amount which is applied by temporality charge. *There may be cases in which the driver is not fluent in English. We appreciate your understanding. *A sightseeing taxi is a service which we drive you to the sightseeing facilities on our taxi according to the sightseeing courses decided in advance. It is not a service which a travel agency provides, therefore our driver will not provide comment on the sightseeing facilities and guide you. It is possible to drive you to the sightseeing facilities which are not on the sightseeing courses. If you would like to visit optional sightseeing facilities or sightseeing courses, please contact us from the e-mail inquiry form. For reservations and inquiries of sightseeing taxi, please contact the following telephone number or e-mail form.